Dean Graves, and Kerri Allen (photo by Owen Ogletree). 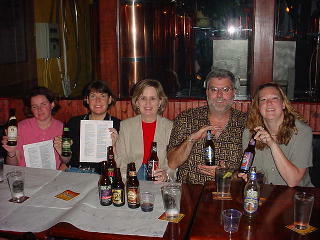 Owen Ogletree (director of Brewtopia Events) gathered together some of his fellow beer enthusiasts on April 24, 2002 at Athens' Copper Creek Brewing Company brewpub to sample and comment on several mixed styles of ales and lagers. This beer sampling was done as a blind tasting where no one was aware of the brands that were being served. Beers were informally commented upon and ranked according to American Homebrewers Association (AHA) style guidelines. First, second, third places, and honorable mention were awarded to the beers we felt represented their individual styles in extraordinary fashion. Drop Owen an email to share your comments and opinions. Aroma: Floral, malty, light and appealing. Appearance: Straw colored with a medium gold glow. Flavor: Bready, malty, floral hops, very nice for style. Bitterness is perfect and hops are smooth and pleasant. Aroma: Oak, caramel, malt, chocolate -- very pleasant. Appearance: Dark amber and clear. Flavor: Slight roast, caramel, bready notes, dry. This is a delicious example of an Alt that is very smooth yet complex. Aroma: Light floral aroma, hints of tea and malt. Appearance: Amber brown -- dark end of style. Flavor: Medium body, malty, fruity, tea, wood, malt. Hops are in the background, but well balanced with malt. This is a malty, complex ale. 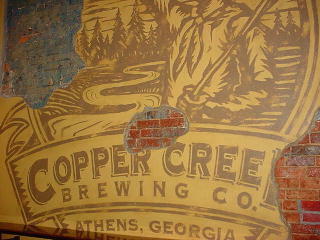 Appearance: Clear, copper colored with a beautiful glow. Flavor: Big, malty body with American hops that are covered a bit by the rich malt. This is a pale ale with more body than most. Hops are moderate, but in balance. Bitterness and hops become more apparent with each sip, however. This is a great, satisfying ale. Aroma: NW hops, piney, fruity, malty. Appearance: Dark gold/copper in color. Flavor: Piney, citrus, resin flavors from American hops. Medium-bodied with a great malt/hop compliment. This is a well balanced, clean example of the style. Bravo. Aroma: Malty with hints of sulfur? Floral hops are mild and pleasant. Appearance: Light straw in color, very clear. Flavor: Good body with a rich malt character and good bitterness. Aroma: Slight malt, caramel, wood-like hops, hint of vinegar?. Flavor: This is not bitter enough to be a true IPA, but suits the category of English Pale Ale well. This beer is slightly bitter, dry, and hoppy. Very close in flavor to many milder cask Pale Ales in England. Appearance: Slight haze, dark gold. Flavor: Resiny hops that taste more American than English. Citrusy hops give a nice character. Malt is restrained. Aroma: Like an American Lager with hints of caramel, interesting. Appearance: Dark brown with ruby hints -- beautiful. Flavor: Sweet with honey and maple hints. Corn notes are also present with light caramel. Hops are not noticeable. Aroma: Sweet aroma of malt and honey. Appearance: Nice, golden, clear and brilliant. Flavor: Wine-like, fruity, pineapple, apple, floral clover honey notes, malty. Hops are not noticeable. This is a flavorful beer, but hops are too light for this category. Appearance: Dark in color with a deep brown hue. Flavor: Chocolatey, dry, slightly smoky with hints of salt and minerals. This is a rich, remarkable ale, but the seaweed character is really not very noticeable. Aroma: Slightly fruity with a very light aroma. Appearance: Dark brown with great head retention. Ruby red highlights are attractive. Flavor: Nice medium, creamy mouthfeel with very mild flavors of fruit, mild toffee and hints of caramel. Aroma: Sweet cream and light fruit. Appearance: Very dark with red notes. Flavor: Hop dryness, light malt, sharp flavors from dark malts, caramel, hints of chocolate syrup. This is a tasty beer with a good mouthfeel and depth of character. Aroma: Slight resiny/citrusy hops with a hint of butterscotch. Appearance: Slightly hazy with a nice golden color. Flavor: American NW hops, citrusy, fruity, nice mouthfeel. Hop aroma, flavor, and bitterness are the main components here. A nice, light ale for folks who enjoy hops.